October 17th I turned thirty-one years old. Hard to believe this time last year I was opening air mail packages in a tiny apartment in Ankara, Turkey. I didn't want to put anything on the girls calender as this year has already been a whirlwind of activities. So, I was shocked when Thursday night my doorbell rang and standing outside were 6 of my best friends, holding a cake and singing Happy Birthday. I hear Jenny made the cake (Thanks Jenny!) Very cute and tasty. Bree and Bauer helped us celebrate by creating some very peaceful background music on Chris's drums. I have the most amazing girlfriends of anyone in the world. It was so nice to sit and chat with them. Felt like the old days in the dorm when we could all just walk down the hall and hang out. Too bad hanging out like that now involves an hour drive for most of us. Better than a 10 hour flight to Turkey though right? Then Sat. night the family and I descended on PF Chang's for some very tasty chinese food and for me, a pink dingo, the drink of choice at our wedding. The pink dingo turned into something green. What can I say? I indulged in a rainbow of celebratory beverages. After dinner we all went back to the apartment for cake and presents. All in all a terrific 31st B-Day. So terrific in fact, when Chris asked me the next morning how it felt to be 31, I was a little confused. Wait, I'm a year older? I thought we were all just getting together to celebrate. I feel happy and blessed and optimistic about life. So whatever number of years goes along with that feeling, I'm fine with. In keeping with the theme of "behind the scenes of Chris and Sarah's Wild Ride", here's a set of pictures I call "shots I had no idea I was in until they were shown to me a month later". Did I ever not have a camera in my hand? My dad is still sore from the rock hurling. Might be picking my nose here, not sure. Chris is just thrilled that I'm taking my time in picking out the right French blouse. Got to get close sometimes - the girl walking by is so curious about what I've found in the bushes that warrants stopping for a picture...she'll never know. Camera might be getting a bit heavy at this point. This is how we did it folks. Great idea dad...an evening walk to the nearby cemetery. It was very interesting. There was even a man there walking his baby in a carriage because the baby couldn't get to sleep. An oddly peaceful place to be. Whatever my mom just said I think it's safe to say I doubted her. The next water wheel is...umm...umm...behind us? Only Chris and I (and my mom and dad) know the story behind this shot. And thus it shall remain. First fajitas in months. I think Chris looks funnier here than I do! Perfect photo summation - this was literally the last afternoon of our trip. Our faces say it all. Hope you're enjoying this behind the scenes tour! Sometimes it's hard for me to believe I ever lived in Turkey. The reality of my past Turkish life hit me hard this weekend. While at my grandmother's 85th birthday party, I had the special chance to meet all her friends that live with her in her retirement home; a very happy, out-going, well-traveled, humorous group of ladies, all of whom (thanks to Nana) got to be a part of Chris and I's insane journey in (and back out of) Turkey. 2. I need to be careful what I type, as about 47 grandma's are reading what I write. So glad they are though. It's neat to know we can provide a little entertainment, and that people actually like reading this stuff. So this one's for all the lovely ladies at Lakewood - thanks for celebrating with us yesterday - enjoy! One of the most frustrating things about living in Ankara was the lack of general hygiene and the poor medical care. The shower spewed forth dirty water, the tap water was undrinkable, the washing machine ate holes through our clothes with its rancid water, and every doctor's visit ended in the prognosis of - "you have a cold." The few times we did get sound medical advice, it came in the form of a phone call to my good friend Jenica, a trip home to the States, or WebMD. Upon suspicion of tiny, mean, itchy creatures in our sheets, Chris decided to disinfect them. (The sheets, not the creatures). We've done market research, held some focus groups, talked with our lawyers, and found 18 topics we can blog about that won't get us in any kind of trouble, but will still hold an audience. 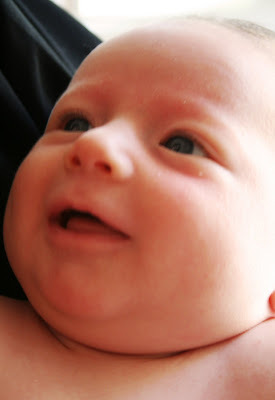 Topic #12 of safe, interesting topics - baby photography. You'll remember I took some pictures of my friends Julie and Sean's kiddos this summer. This weekend I had the honor of taking pictures of Ashley and Brad's beautiful new baby boy. 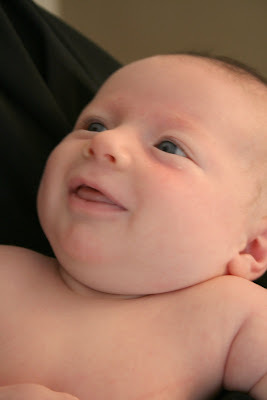 Brandt loved the camera so much, he smiled his first smile during the session! Ashley and I couldn't believe it. Unfortunately we weren't in the best light and I didn't want to flash in his eyes so the pictures are a little blurry, but you get the idea. I love taking pictures of kiddos and families and am working on building my own photography business. If you would like a photo session I am doing them right now for free as I try to work up my portfolio. Photos for Christmas cards, newborns, families, silly, serious, the sky's the limit. I have fun ideas but am open to whatever you want or need. Leave a comment or email me to set-up a session.